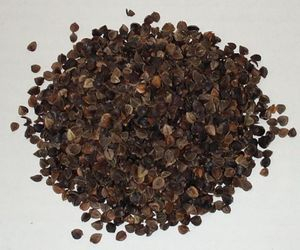 Additional refill buckwheat hulls are available for your pillows. Full replacement for the Makura is 4 lbs. the Makura XL and Rejuvenator 7 lbs. Item # HULLS $5.95 per lb. Extra pillow grade cleaned buckwheat hulls are available for the Makura and Rejuvenator Deluxe pillows. After a couple of years, the hulls may lose a little of their bulk and need added to, or if you are broad shouldered and just want some extra height to your pillow. If you wish to completely replace the hulls in your pillow, the traditional size Makura uses approximately 3-3/4 lbs., The XL size Makura uses approximately 6-1/2 lbs and the Rejuvenator Deluxe uses approximately 6 lbs. The Comfort Roll is sewn closed and and does not require additional hulls. All the buckwheat hulls are U.S. grown. Two pound minimum unless ordered with pillows.